Spacious two bedroom, two bathroom property with private garden and log burning stove. Open plan living areas with log burning stoves and under floor heating these four cottages are warm and cosy. Either overlooking the centralised courtyard from the one bedroom cottages with lawn areas and olive trees or with views up the field to our Shetland Pony Pickles, each cottage has its own unique feature. Our newly planted apple and pear trees will display beautiful blossom in the spring and fruit late summer. Having moved from Guernsey in 1995 our family have established Abshot as a vibrant and successful independent Country Club. Having two children and two dogs we are often walking or cycling to the local coastline or taking days out across Hampshire. 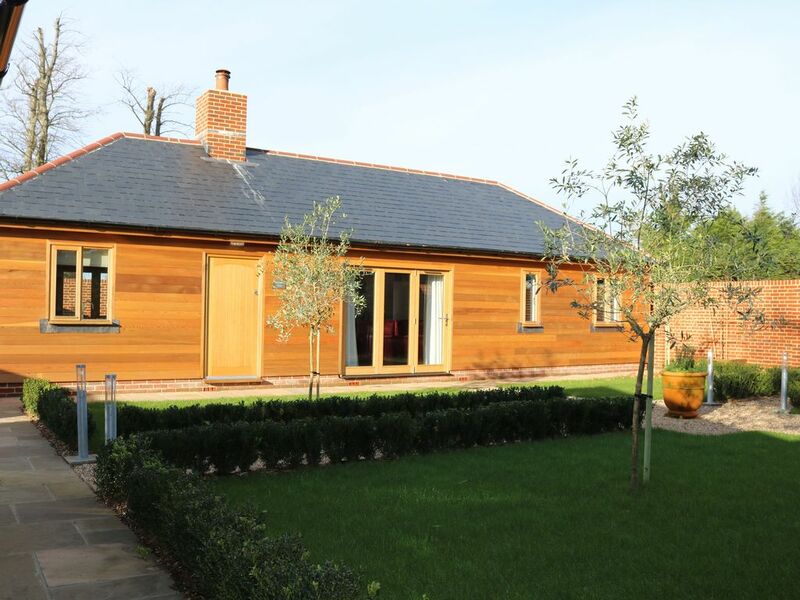 Four newly built cottages set within the grounds of Abshot Country Club. Close enough to local amenities and sightseeing yet tucked away from the hustle and bustle. Start exploring the South Coast from our very doorstep with numerous walks along the coastline. Our comfortable one and two bedroom properties offer log burning stoves, under floor heating and cosy décor. En-suite to the master with shower cubicle. Family bathroom with bath and overhead shower. Under floor heating and heated towel rails. Dual aspect log burning stove with basket of logs and accessories. Oak beamed vaulted ceilings in the living area with bi-fold doors out to the private garden and communal courtyard. 1 mile from warsash and 3 miles from Hamble both sailing havens. Great little cottage. Very modern and equipped with everything you could ask. Used the swimming pool at the Country club everyone there was very helpful. We all loved the goat and pony they were super friendly and always came over for a stroke. Great little garden for the dog. We will be back, thank you. We needed a peaceful rest after the xmas madness and this didn't disappoint in any shape or form! It was clean, tidy and so very welcoming - we were given a bottle of soft drink, biscuits and doggie treats - my son and our dog were very happy and once we cracked open a bottle of red and threw logs on the wood burner we were all ecstatic. A wonderful place to stay - loved the two bathrooms and small garden space (for dog) Rebekah was always available if you had any problems (not that we did). It was hard to leave as we loved it so much and will most definitely return. We enjoyed our stay at Squirrels Drey. The property was well equipped, spotlessly clean, comfortable and quiet. The private garden was fantastic for our dog. The added bonus of a pool, gym, tennis and cafe on site ensures that there is plenty to do. The surrounding area is also ideal with the Solent Way easily accessible and local pubs, shops and restaurants just a few minutes away. We particularly enjoyed The Nook restaurant! Highly recommended for a relaxing break. Lovely property in an interesting area. The property is a lovely open plan space, immaculately clean, with most things you would need. We arrived early and had coffee in the club. The property was ready so we were given the keys early. There were some nice touches like cookies and juice to welcome us plus there was milk in the fridge and plenty of tea and coffee. It was an excellent base for visiting Southampton and Portsmouth ( we advise using the excellent park and ride for the latter. There are also interesting places for walks locally - Titchfield Nature Reserve and take the little pink ferry from Warsash to Hamble-le-Rice. All in all a superb holiday! We had a short family break here and everyone loved it! Rebecca is a great host, with a welcome pack and sorting out a very minor issue quickly and professionally. We enjoyed using the club facilities and going to the local beaches - pebbly but great for chilling out and collecting shells. The Osborne View was recommended for dinner overlooking the sea and didn’t disappoint. A hidden gem - thank you for a lovely stay! Whether your interests lie in bird watching, walking, sailing, theme parks or shopping you'll find something that suits all tastes, ages and abilities not far from our doorstep.